I have so many fond memories of pomegranates. Growing up, they were always in our household. Although the pomegranate has only recently gained popularity in the United States, it is a central food in Iranian culture. The Pomegranate originates in the are of modern day Iran to northern India. The pomegranate has significant meaning in many cultures and to Iranians, it's a symbol of fertility and sometimes immortality due to it's health benefits. Pomegranate is used to make fruit leather, stews, stain fabrics and cloths etc. Pomegranate was one of my favorite things to eat growing up, despite always staining whatever clothes I was wearing. My sister and I always joke that there is no greater way of showing love than a parent who shucks a pomegranate for you. So yea, I kind of have a love affair with pomegranate and have wanted to use it in a recipe! I recently got some pomegranates in my CSA and started brainstorming on how to use them. When I got my Sipsby box I had this fascinating tea blend by Leaf & Twig. Lavender and Mint. Let me tell you something about these two flavors, I love in all things except tea. Don't get me wrong I can enjoy tea with these flavors but they aren't my favorite. I love lavender bath products and I love mint ice cream but these aren't my first choices in tea so when it was time to come up with a recipe I was truly stumped. This tea have lavender, peppermint, honeyroo and chamomile flower in it. I thought forever and ever about what to make and what flavors to use. When I can't come up with something I take a chance and do an experiment. I had a pomegranate and figured that the sweet & tart taste could provide a bit of oomph to this herbal blend. I started thinking that a cocktail might be the answer but didn't want to taint these delicate flavors with alcohol. The tea blend is so pretty that I set out to create a fun, non-alcoholic tea cocktail to make when you're feeling fancy AND want to have a nice cup of healthy goodness. The bigger your pomegranate the better (in general) and for this recipe. I used one of those hand held lemon reamers to get as much juice as I could from the pomegranate. Make sure to take off a few seeds for garnish before juicing. I added the juice to some fancy glasses as the base. I strained the brewed tea and let it cool before adding it to these glasses so that the liquids could interact without changing each other too much. 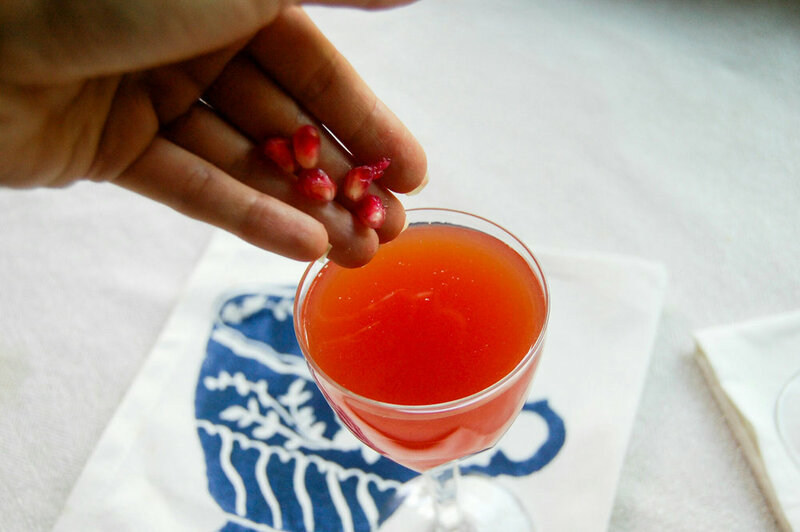 Mix up the tea and pomegranate juice and let settle before adding garnish. I was discouraged at first when the pomegranate seeds sank to the bottom of the glass. I've seen so many drinks that have the seeds as a garnish and they are floating so what the heck! I took a spoon and brought the seeds to the top and somehow they stayed! If your seeds sink, make sure to bring them to the top and they will stay on top or if you use ice it will be easier for them to float as well. I set out to make a fun fancy drink and all I could think about this drink was MEH. Red on red. Seemed pretty lame. It was pretty in it's own way but needed something extra, some more color. I reached back into the tea tin and pulled out a bunch of these chamomile buds and placed them gently on top and BAM ! Cocktail transformation! The colors are so pretty and this drink looks like some expert mixologist made it, but in reality you are the expert mixologist! The pomegranate adds a nice sweet and tangy flavor to the min and lavender that is actually quite good! Enjoy! I find all sorts of fun brands through instagram and I was so excited to come across Owl's Brew which combines beer & tea! I was at a total wine & more and came across this flavor that combines amber ale, darjeeling hibiscus, strawberry and lemon juice. How could I resist?! Just a little background, I actually enjoy a good beer so the thought of combining beer and tea was really exciting for me. They have a stout coming out in October with chai and I can't wait to try that one too! After some thought, I decided that the black tea and lemon would be a great combo with tequila. I also wanted to add a little spice so I included some ginger liqueur as well. The great thing about this cocktail is that you should make it one cup and you can control how strong or weak you want the drink to be! I suggest using equal parts tequila and ginger liquer so that you get both flavors but it's not too strong. Once everything is in the cup just fill the rest of the cup with the Owl's Brew! The majority of the drink is the Owl's Brew so it's bubbly and sweet! I really like the taste of these flavors combined especially because the Owl's brew has the distinct taste of beer AND tea. The lime garnish is a great addition to give your drink an extra kick if you'd like! 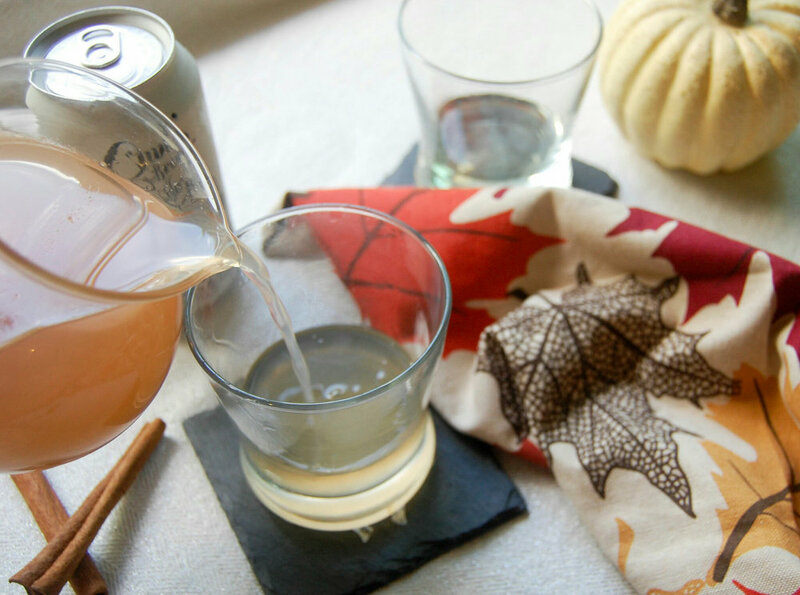 This is a super easy drink and could be made into a pitcher as well if you have a larger party. Do you have a favorite tea cocktail?! Summer time means lots of fun drinks and although I'm not the biggest fan of wine, I knew it would be good to make a sangria with this jasmine tea from Just Tea. That came in my sipsby box. I love that this tea combines the purple tea and jasmine with cornflower blossoms. The cornflower blossoms make the tea so beautiful! In my recipe I talk about choosing 3 fruits. I chose peach and blueberry and then cherries for the garnish. I also later threw in a bunch of cherries as well. Soaking the fruit in the ginger liqueur gives the sangria more depth in it's taste. 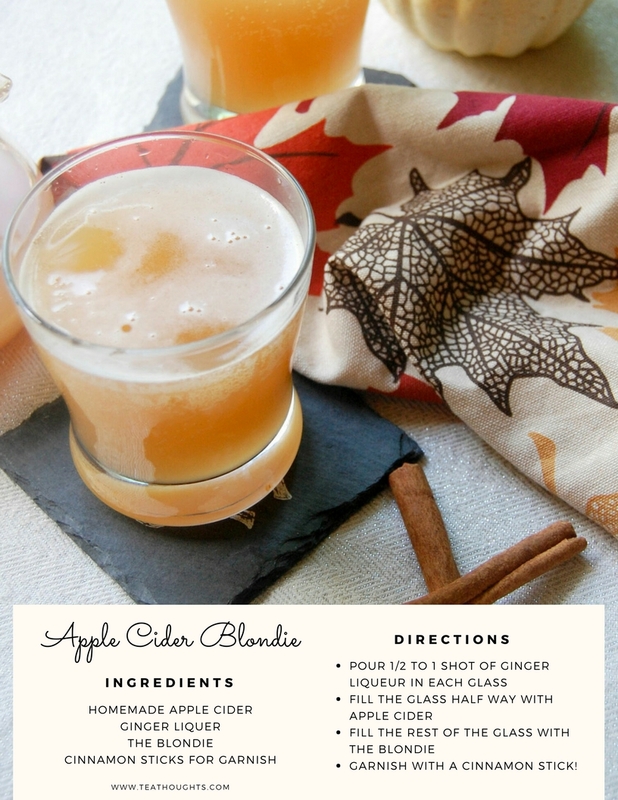 I chose the ginger liqueur because I thought that ginger and fruit are a delicious pair and ginger is also a versatile flavor when it comes to making cocktails. I took a trip down memory lane when I chose vinho verde for the wine. As I've discussed I'm not much of a wine drinker but I do enjoy bubbly drinks. Vinho Verde is definitely bubbly. In college, my roommate and bestie introduced it to me and I fell in love. Sometimes we would make excuses to stay in instead of going out and share a bottle while watching movies. I have such wonderful memories of vinho verde and that's why it had to be what went in the sangria! In my directions I talk about putting in the fruit first but in this photo that's not what you see. This was just a lesson learned after making the sangria. The order of the fruit doesn't matter too much but it's better to put the majority of the fruit into the pitcher when it's empty so that you avoid lots of splashing! After the entire bottle of wine is poured into the pitcher, you can top it off with a little extra ginger liqueur for taste if you'd like or perhaps add a drop or two to each glass you pour. If you want some guidance on choosing fruit, I would say that of the 3 that I used the peaches were the best. They soaked up the flavor so well and it was easier to fish out the pieces to enjoy. The blueberries were also good and cherries as well but If I created this again I would probably substitute the cherries with raspberries! What fruits would you choose? !